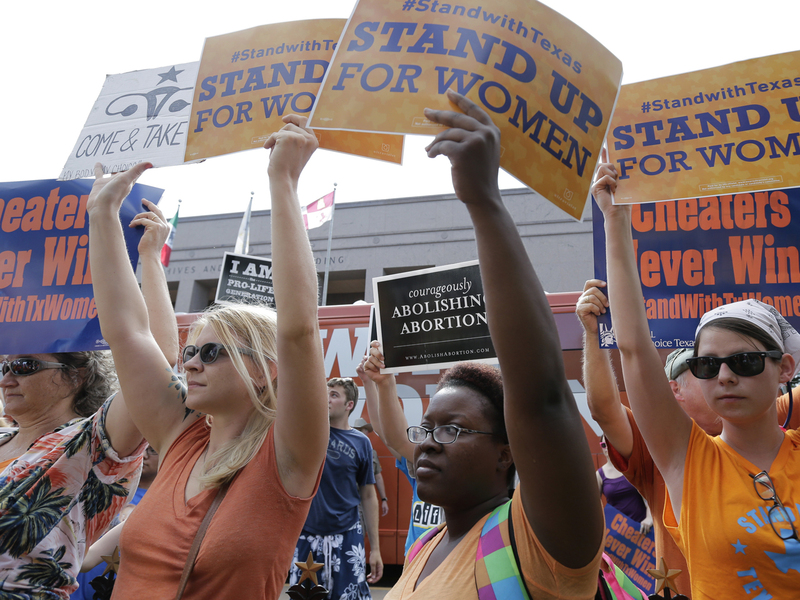 AUSTIN, Texas New abortion restrictions passed by the Texas Legislature are unconstitutional and will not take effect as scheduled on Tuesday, a federal judge has ruled. District Judge Lee Yeakel wrote Monday that the regulations violated the rights of abortion doctors to do what they think is best for their patients and would unreasonably restrict a woman's access to abortion clinics. Lawyers for Planned Parenthood and other abortion providers brought the lawsuit, arguing that a requirement that doctors have admitting privileges at a hospital within 30 miles of the abortion clinic would force the closure of a third of the clinics in Texas. They also complained that requiring doctors to follow the Food and Drug Administration's original label for an abortion-inducing drug would deny women the benefit of recent advances in medical science. The Texas attorney general's office argued that the law protects women and the life of the fetus. Attorney General Greg Abbott was expected to file an emergency appeal of Yeakel's order to the 5th Circuit Court of Appeals in New Orleans. The law passed the GOP-controlled Legislature despite a marathon speech in June by Democratic Rep. Wendy Davis, who is now running for governor and amid massive protests on both sides of the issue at the state Capitol. Beginning Oct. 29, the law would've required abortion doctors to have admitting privileges within 30 miles of the clinic, that they follow strict instructions for pill-induced medical abortions, and only perform abortions after 20 weeks of pregnancy if health of the mother is in danger or the fetus is not viable. The law would have also required all abortions take place in an ambulatory surgical center  a mandate that only five out of the 42 existing abortion clinics in the nation's second most populous state currently meet the requirements for. That portion wasn't challenged legally since it won't begin until 2014. Also not included in the suit was the 20-week ban since the vast majority of abortions are performed prior to that threshold. In last week's hearing, Texas Solicitor General Jonathan Mitchell defended the law, saying it not only protects mothers but also "fetal life." Mitchell said statute "allows the state to impose such restrictions as long as it does not impose an undue burden on the patient" and that those suing have no evidence it will adversely affect women getting abortions. Attorneys for Planned Parenthood called witnesses they said can showed how the admitting privileges and new rules on medical abortion are harmful to women and could force many clinics around the state to close. An emergency room physician from Houston, Dr. Jennifer Carnell, said requiring hospital admitting privileges would not improve the care women undergoing abortions receive  even for those who have medical complications that require urgent hospitalization. Dr. Paul Fine, medical director of Planned Parenthood Gulf Coast, said many doctors don't like to tell many people they perform abortions for fear they could be targeted for violence by activists  but Fine said the risk was worth it because he saw what women went through before the Roe v. Wade U.S. Supreme Court decision. "I remember women coming in with a coat hanger," he said. "Deaths were common and tragic, and I'll never forget the look in those women's eyes." When the state asked how many abortions he performed last year alone, Fine answered "probably several hundred."